Paula Nava Madrigal is a cellist and one of a small percentage of Latinx female conductors in the United States. In addition to conducting orchestras, she teaches classical music to immigrant youth, providing free lessons and instruments. Paula has long been committed to social justice and inclusion in music education. It is her deep belief that all children deserve to receive musical education, no matter their social, racial or economic situation. 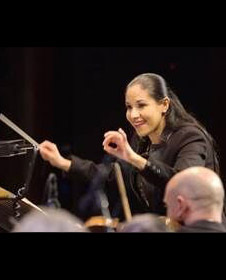 Originally from Mexico, she developed her career as a musician while also conducting orchestras and teaching students from different social classes and economic situations. When Paula moved to the United States, she teamed up to provide free musical training to Latino and immigrant youth. She and her team “Young Strings Project Outreach” run two free programs, teaching the Seattle World Youth Orchestra and at Casa Latina and BCO Youth Orchestra at Sunset Hill Community Club. Paula also founded the Ballard Civic Orchestra in 2016 to further her goal of bridging the gap between her community and classical music. With BCO, Paula works to showcase Latino soloists and composers, and to make performances as accessible as possible, concerts are free and take place at a variety of venues throughout the greater Seattle area. The Seattle Weekly calls Paula “expressive yet rhythmically precise"
Paula is BCO’s conductor and music director. She holds a BA in Music from the University of Guadalajara, where she was recognized as an “outstanding student” in cello; and a BA in Education from the Escuela Normal Superior de Jalisco. She also received a master’s degree in Education from the University Autonomous of Guadalajara and completed her post-graduate work at Nebrija University in Madrid. She studied conducting with Guillermo Salvador and Jose Luis Perez Garrido with the support of CONACULTA Mexico. Ms. Madrigal has attended conducting institutes, simposios and workshops in Mexico City, Veracruz, Puebla, Zacatecas, New York City, Oregon and the New England Conservatory. She attended the 2016 Medomak Conductors Retreat in Maine. Currently, she is co-founder of Cascade Conducting and conducts the Seattle World Youth Orchestra and also is co-founder, conductor, and artistic director of the Ballard Civic Orchestra which has received awards from Seattle office of arts and culture, Department of Neighborhoods, the Seattle the Latino Community Fund, and She received the “Premio del Consejo Directivo” Seattle Latin Music Award from Univision in 2017.